I love basketball. It’s been a love affair for me since those early days in Indiana when my dad nailed a hoop to an old red barn on the old Ray Woods place. I see a lot of games during basketball season. It’s not uncommon for me to see four to five games a week. Probably I’m most fond of watching small college or the smaller division of NCAA or NAIA. The other night I went to see a game between two small NAIA schools here in Tennessee. I saw two good schools, kids behaving themselves, going to class to get an education and two good coaches doing things for the right reasons. I arrived at the game early, something I often do. Not too far from the gym there was a small restaurant, a mom and pop operation. As I entered the restaurant I was greeted with “What can we do for you, hon?” Pretty common greeting in the south. I got a cup of coffee, found myself a paper and set in to kill a bit of time before the game. By the way, stay away from the sweet tea down south, they put more sugar in their tea than Dominos makes. As I sat there something caught my eye. I saw two older gentlemen coming out of a high rise building, a senior citizen retirement center. These two men are attempting to make their way down some steps and off the curb to cross the street to this restaurant where I am. I watched with some discomfort for them. Both are using canes and they are making their way at about the pace of a sick turtle. As they made their way in one of them said to me as he passed, “Hey young fella, how you doin?” They asked if they could sit at the table next to me. Of course, I tell them. “My name is Earl and this here is Eddie, we live across the street; don’t think I’ve ever seen you in here before.” It quickly becomes evident that ole Earl is the spokesperson for the two. I tell them I’ve come to the ballgame and I’m just killing some time. “Good place to kill it.” From there I find out a number of things. “We both lost our wives this past year and we are good friends, and so everyday we just kind of look in on each other.” As I drove home that night I got to thinking about Earl and Eddie, and what Earl said to me: “We both just kind of look in on each other.” I thought good friends do that, you know, they look in on each other. The following post is something I wrote in November 2013. I think it speaks for itself and the way some people act and how others can influence us if we are not careful. A few years back as I stood on the floor of the Roman Coliseum it quickly became evident to me that I was not in Pimento’s gym, or for that matter even, Hinkle Fieldhouse. Interesting isn’t it – who influences whom? I wrote the following early one morning sitting at my coffee shop after attending a basketball game the night before. It was a memory that has continued to stay with me these nearly fifty years.The pictures are of the old high school (Pimento) where I went to school in Indiana. The elementary building that once was there has been torn down. The high school closed in 1961 one year after my graduation. The second picture is of what once was the gym. Can you believe they now have “church” where I once played? Hey, that place always was “sacred.” Actually there no longer is any activity there and the building is in sad disrepair. The old home of the Pimento Peppers. Then home to Countryside Christian Church. Note the basketball goal in the rear of the sanctuary. What is one of the worst things that can happen to you? Sorry, that is a loaded question, I agree. If you were in your teens, living in Indiana and playing high school basketball, I can give you an answer. I once experienced it. It happened on a basketball court. The year was 1960, and I still remember the town and much of the particulars. It was a cold winter Friday night. Looking back today, I can smile, in fact, take comfort and encouragement from what happened on that night, but it was not so easy then. Also, what happened off the court was even more important than what happened on the court that night. It was the 4th quarter of the game, very late in the game, and my team was down by 1 point. I stole the ball, intercepted a pass and was off like lightening (well, that is a bit of an overstatement, but it reads better in writing). I broke for my team’s basket at the other end of the court. I’ll cut to the chase. I was well out in front and took off to the basket about a half a step too soon, and I missed the layup. We lost the game and I felt horrible. My coach and teammates did not hold that missed layup accountable to our loss, but I did. e doorway of the kitchen, “Sit down.” What he next said to me is something I carry with me still to this day. “I know you feel bad about missing the basket, but your mom and I are proud of you. We felt bad for you, but you did not lose the game. We’re proud of you. Now, go hang your suit up. I think you have another game tomorrow night.” With that, I hung up my suit and we all went to bed. How we all handle our “missed baskets” in life and how those around us choose to help us handle them is so, so important, especially to a young person. Below is something I wrote Nov 1, 2013. I do think more fans should well realize where they are and that being a fan does not give one license to be a jerk. They probably could not do as good a job as what the players and the officials on the floor are doing. So tone it down a bit…ok.. This week began another basketball season. I love basketball. 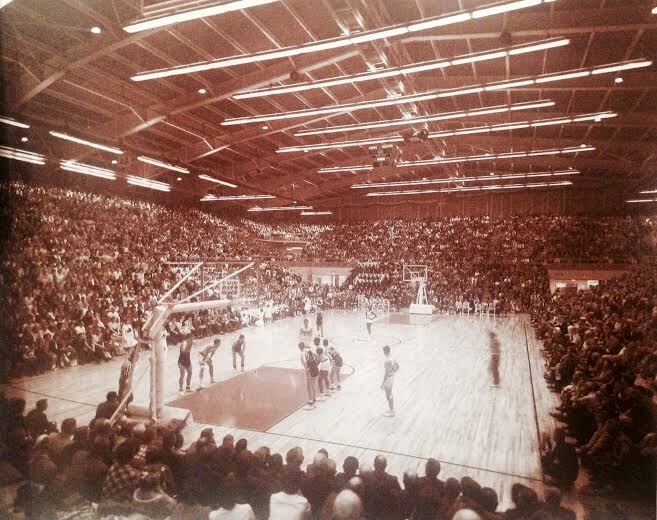 I attended my first basketball game when I was five or six years old. I have not missed attending a game every year since. That would now be 65 years. This week as I sat in the stands watching the beginning of another season, it made me think about the players, coaches and the fans. As I drove home that night I thought about a speech once made by Teddy Roosevelt. I don’t know if Roosevelt liked basketball or not or if he ever attended a game; but he said something in a political speech that I think has application to sports and the role of players and fans. It is not the critic who counts; not the man who points out how the strong man stumbles or where the doer of deeds could have done better. Who neither know victory or defeat. The coach at one of the college games I often attend once asked me, “When I look for you, you are generally sitting up high and away from all the crowds, why?” “Why,” I said. “Because I don’t like sitting around all the “know it alls.” Those folks Roosevelt described as, “Those cold and timid souls who neither know victory or defeat.” The ones who have never stepped before people in an athletic contest, yet for some unknown reason to me, think they know so much and they don’t know spit. More fans should remember two things: one, the arena in which they are sitting, and two, that they are in the bleachers. Only if you played and lived the game can you so aptly feel the words Brokaw uses to describe the feelings and emotions related to the game of basketball. I played in gyms where there was a pot belly stove in the corner. I have dressed in class rooms and locker rooms with smells that never leave you. His descriptions are right on the money. The two pictures are of old Indiana high schools gyms where once there was great joy and also pain to the lives of thousands of young and old people in that state. Below is something I wrote in 2013. 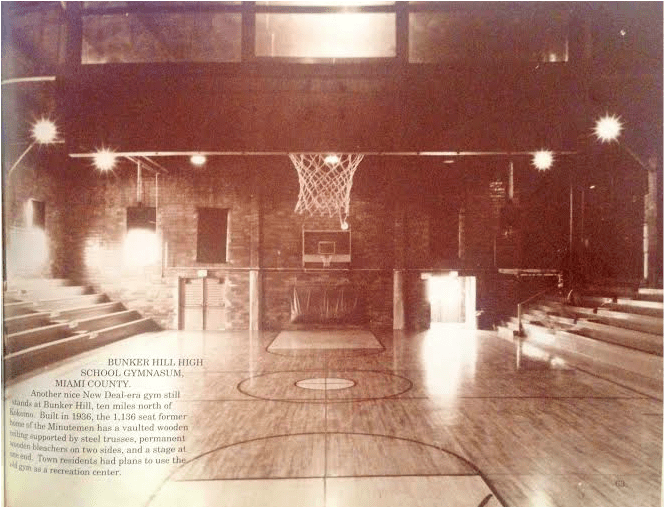 Knightstown Gymnasium – The set for the movie Hoosiers. I have never fallen out of love with her. I sat with her last night and still got that same feeling, same thoughts and emotions. They never seem to go away even after all these years. From the first time I met her still to this day no change. There are times now I wish I could date her like I once did, but we still date. Maybe the following lines that I have taken from another will help describe those emotions. bare-pipe, peeling-paint look of the basement locker room; the sweaty intensity of the players; the friends, family and neighbors hovering in those close quarters; the boorish but loyal behavior of the Main Street businessmen. The locker room door would swing open. The band would be playing the school fight song. The crowd would be on its feet, cheering as cheerleaders called out our names; Whisler, Eide, Soulek, Pokorney, Brokaw. We’d swing into our warm-up routines, layups, outside jumpers, offensive rebounding, now defense, all very serious with barley a flicker of acknowledgement for the crowd. Maybe a glance at a girlfriend, or a potential girlfriend. The former news anchor describes well my thoughts and emotions with Mr. Naismith’s creation, basketball. I have dated her the last three evenings and would not advise one to place a bet that we won’t meet again this evening. A coke, bag of popcorn and the walk to the top of the bleachers where I will meet her for another date. She will be waiting. Oh, what a night. Oh what a lady. Only if you grew up in Indiana can you truly understand that statement, “They love the game.” Or the impact that sport has had on the lives of thousands of people in that state. I share two pictures: one is of the high school gym (Frankfort, Indiana) where I taught and coached during much of my teaching/coaching time. The other picture. Oh the other picture. That was taken on a cold February night in 1972 when Frankfort won the sectional title. Can it really be forty-two years ago that this happened? No. way. 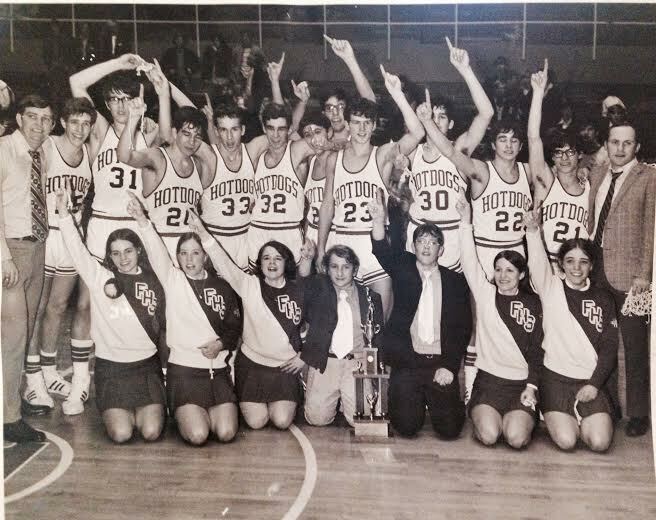 This was many a high school boys dream to “win a sectional.” On the far left is Coach John Milholland and yours truly on the far right with net in hand. I still get goose bumps when I think about that night. What a great group of kids and what great memories they gave us. Below is something I wrote in 2009 that kinda gives one the picture of what basketball meant to many in that state. 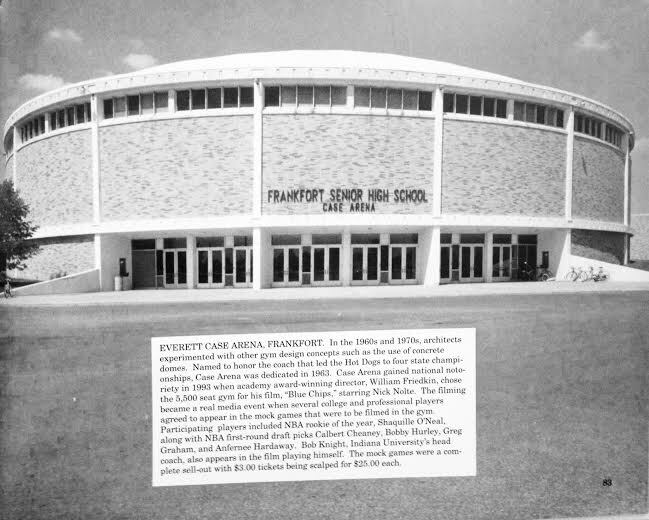 February 1972 -Frankfort won the sectional title. On the far left is Coach John Milholland and yours truly on the far right with net in hand. Recently, we returned from one of our basketball junkets; something my oldest grandson and I have been doing since he was about 10 years old. He and I go to Indiana during the Christmas holiday season to see some high school and college basketball games. In this junket, we “only” got to see fifteen games. That’s fifteen games in three days. Being from Indiana, over the years, I have been a witness to and have heard many stories that illustrated how much people in Indiana have a love and a passion for the game of basketball. I was once told the following story. In 1978, Indiana State University was hosting Wichita State, and the game was the first game to be nationally televised featuring the legendary Larry Bird. Al McGuire and his cohorts would be broad-casting the game on a prime time, major TV network. A few hours before game time, a major snow storm set in over Terre Haute, Indiana, where the game was to be played. Snow began to accumulate on the roof of the ISU arena, and the roof began to leak down on the playing floor. Big problem! If this snow continued and the roof kept leaking, it could hamper the playing of the game. A couple hours before tip-off, the problem was announced over the arena’s loudspeakers. Another announcement followed, “At this time, we are asking for volunteers to go to the roof of the arena and help with the snow removal.” Yes, you heard me, “Go to the roof and help with the snow removal. Hey, folks, it isn’t 70 degrees outside. Have you ever been on top of a tall building, wind blowing, a shovel in hand and throwing snow off the roof? It was the dead of winter and they are asking for volunteers to do that? Are they nuts? The following is something I wrote almost five years ago. My feelings have not changed. 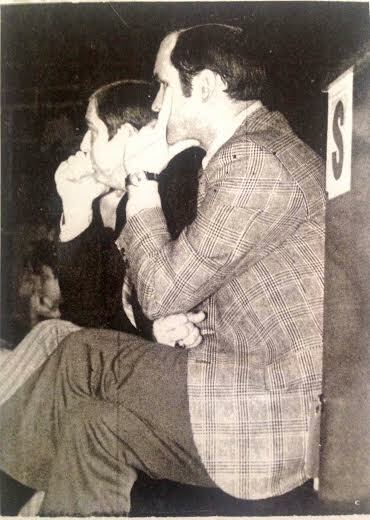 The picture here is of John Milholland and myself at a basketball game where we were coaching. I was John’s assistant at the time of this picture which I think was 1972. I wonder what the score was? We both seem rather calm at the time. You think maybe the game hasn’t started? And the feeling on Saturday morning when you’ve found it. I love that quote, although I have taken a bit of liberty with it. It’s actually from the movie, “Radio,” and I exchanged the word football and replaced it with the word basketball. By the way, excellent movie. The first basketball game I can remember was in 1948, I was six years old. I now have been following basketball for 60 plus seasons. Tonight another basketball season begins for me, and as I sit just a couple of rows behind the bench, I see that all too familiar look on the face of a coach, a look that is hard to describe, a cross between happiness and pain. It really is a great game! The Importance of November 1st. This blog posting is something I wrote on the night of Nov.1st, 2012. Nov. 1st was a significant date during my high school years of 1956-1960. 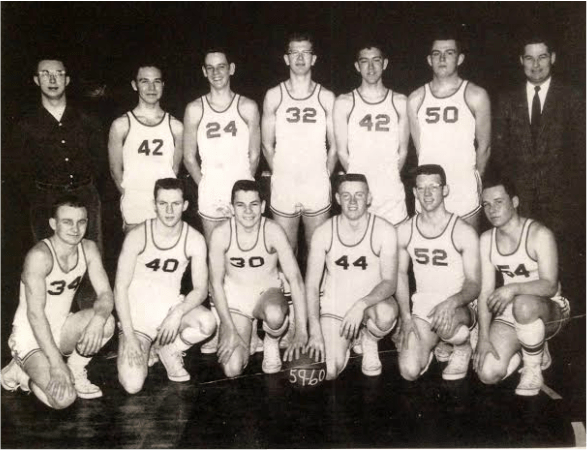 The picture is of the 1960 Pimento basketball team. Should you have trouble identifying yours truly well I am #40 (with a bit more hair). 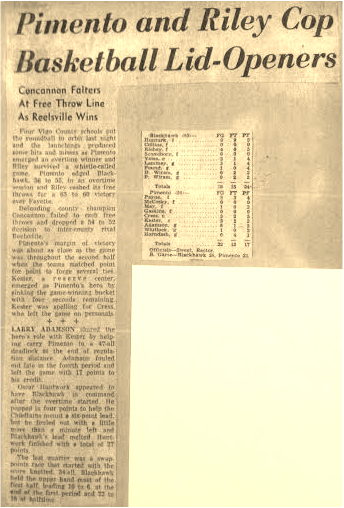 The other item posted here is the newspaper article and the box score of that opening night from the basketball season that year. I hope you enjoy the article and maybe if from that time a good memory or two returns. Tonight is a very significant date in history, November 1st. Yes, it is in my history and the history of thousands of guys who grew up attending small high schools in the state of Indiana in the 1950s’. If you grew up then and attended one of the many small high schools in the state, you may remember this date. At that time, there were nearly eight hundred high schools in the state, and many of those schools were small, rural schools that did not have a football program. November 1st was the date the Indiana High School Athletic Association, IHSAA, would allow the basketball season to begin. I can still remember it like it was yesterday. There is a line from an old Statler Brothers song that goes, “If I could just be a part of your memory the rest of your life.” Many happenings from that time, certainly including basketball, would be a part of those memories for me. 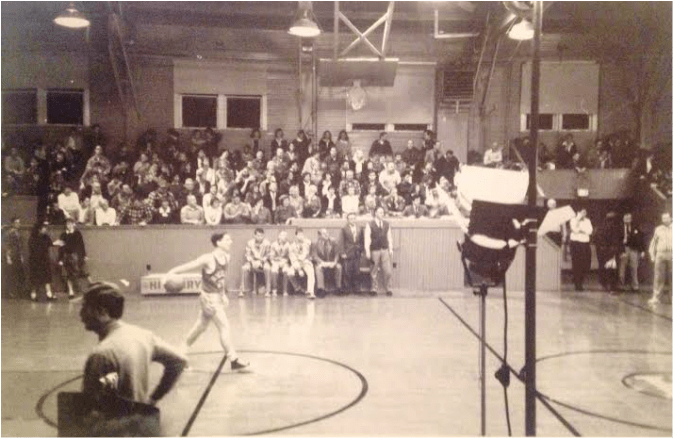 November 1st, 1960, 7:45 p.m. on a Friday was the normal tip-off time for most varsity games. On this November 1st, it was the Blackhawk Chieftains versus the Pimento Peppers. Now, stop laughing. The Chieftains were dressed in their traveling red and black uniforms, and they were led by veterans Bobby Morse and Oscar Huntwork. (Oscar’s dad was my barber. He had a shop in the back room of his small grocery store.) The Peppers dressed in their home white with blue and orange trim. I bet 99 per-cent of the guys who played Indiana high school basketball can remember their basketball uniform number. Mine: 40 in the home uniform and 20 in the traveling uniform. It has been said, probably only by me, that in the late 1950s’ the best thing that could happen to a young Indiana high school boy who played basketball was three things: one, on a Friday night, you’ve beaten the local school from a few miles down the road; two, your dad let you have the car for an after-game date (chances are you had a curfew of midnight); three, that one certain girl, maybe a cheerleader, maybe not, would go out with you. If all that happened on the same night, the stars were truly aligned. Well, on November 1st 1960, the stars were aligned perfectly. The Peppers won on a last second shot. I did foul out but hey, I scored 17 points. It was the start of my last year in high school; my last basketball season. I would like to say it was the beginning of a very winning season, but it was not. All four years of my being a Pepper, victory did not come often. By the way, for those of us who lived during that time, basketball wasn’t our only memories from those Friday nights. But a very significant one. Last year, on one of my basketball junkets back to Indiana, I attended an Indiana State University basketball game and ran into Oscar Huntwork. Neither he nor I looked nearly as intimidating as we once did, or thought we did, on that particular November night back in 1960.